Parallelograms on same base and between same parallels have same area. 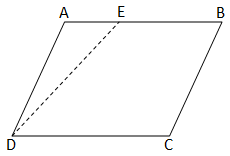 In the adjoining figure, ABCD and BCEF are the two parallelograms on the same base BC and between the parallels BC and AE. 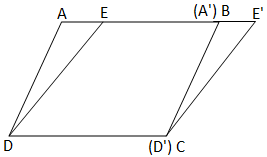 Therefore, area of parallelogram ABCD = Area of parallelogram BCEF. Draw a parallelogram ABCD on a thick sheet of paper or a cardboard sheet. Now, draw a line segment DE as shown in the figure. Next, cut a triangle A’D’E’ congruent to triangle ADE in a separate sheet with the help of a tracing paper and place ∆ A’D’E’ in such a way that A’D’ coincides with BC as shown in adjoining figure. Note that there are two parallelograms ABCD and EE’CD on the same base DC and between the same parallels AE’ and DC. What can you say about their areas? So, the two parallelograms are equal in area. Parallelograms ABCD and ABEF are situated on the opposite sides of AB in such a way that D, A, F are not collinear. 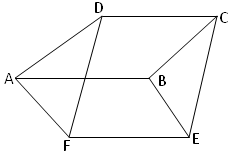 Prove that DCEF is a parallelogram, and parallelogram ABCD + parallelogram ABEF = parallelogram DCEF. Construction: D, F and C, E are joined. Therefore, DCEF is a parallelogram.